It is 1934 and Kirov was the man competing with Joseph Stalin for control of Russia’s Communist Party. Stalin wanted no competition. So Kirov was conveniently assassinated, and in the name of justice hundreds, perhaps thousands of arrests were made, even thought the killer was already in custody. Those “suspects” weren’t really suspected in the murder at all. They were simply too outspoken against the Communist regime. Among those taken were Marya’s parents. Their crime? They once were rich. Her mother was sent to Siberia for three years; her father sent to a coal mine. Twelve-year-old Marya was left to care for her little brother all alone. They lived for a time with greedy neighbors who emptied their apartment of Mama and Papa’s things. But Marya knew it couldn’t be long before they landed in an orphanage. Then Mama’s letter came in the mail, and on it was a return address. Marya decides the family has been split apart long enough. She and little Georgi set out on the long, long trip to find her. This is an eye-opening look at what really went on after the Russian Revolution. The disappearances, the secret police, the way aristocrats were turned into second class citizens, the seizure of farms, the disregard for human life. It was a terrible, terrible time in Russia’s history. Cleanly written and appropriate for ten-year-olds, it’s a fabulous way for kids to “see” what happened. They’ll live history with Marya and Georgi. The story takes place nearly twenty years after the revolution, however, and gives very little history about how the Communist regime came into being. It feels a little like jumping into a movie that’s half over. Some research into the 1917 revolution might be helpful. 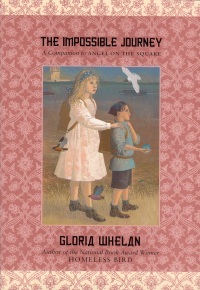 Not my favorite book by Gloria Whelan, but I don’t think that woman can write a bad one. She always writes with an eloquence that makes the pages fly past, and she gives her characters such life. And I’ve always been fascinate by Russian history. I recommend The Impossible Journey. This is a book I would want to read. Didn’t know this history. Similar to one I read called “Between the Shades of Gray.” It occurred in the Baltics and they were all sent to Siberia and the Artic Pole. I love learning about history I didn’t know about. Couldn’t believe how the Soviets turned on their on. It’s so sad, isn’t it, how mankind can treat one other. As a lover of historical fiction, this sounds like a good way for me and others to learn more about Russian history. You’re right. I love to learn through stories. This sounds like a sad, but with an important message. I would like to read it! I think this would be right up your alley, Erik. This sounds like a very powerful book. I am definitely curious about it and the time period sounds fascinating. I haven’t read anything by this author. Thanks for the introduction. Gloria Whelan is one of my favorites, Jess. She just has a wonderful written touch. I know several of her books have won awards. She’s worth picking up. Yay–my daughter (and son) are adopted from Russia. My daughter is a picky reader but she has a HUGE passion for Russia and would probably love to read this when she is a little older. I will bookmark it. That’s so cool, Susan! Thanks for sharing!